A mechanic who runs his own business in West Sussex dressed up as Santa Claus at work to raise more than £1,000 for charity. Stuart Webber, who owns the Webber Motor Company in Three Bridges near Crawley, worked in his red suit and beard and collected donations from customers and at the local pub. 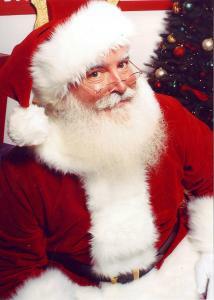 It’s the second year he’s played Santa but is a long-term supporter of local charities. Whether you’re dressed as Santa or in more conventional garb, make sure your motor trade insurance is up to date. You may not need to claim for getting a fake beard stuck in machinery, but it’s always wise to be covered for all eventualities. Mr Webber’s Santa stunt raised cash for Crawley Open House, and last year, he collected donations on behalf of Arundel-based children’s hospice, Chestnut Tree House. He told the Crawley News: “I deal with a lot of charities – I do all the MoTs and servicing for St Catherine's Hospice for free and for Crawley Open House and some others – and what I've noticed is that places like St Catherine's, which is a fantastic charity, have more resources for things like fundraising. He also donates cash from the garage’s profits to seven different local charities each month. Although he had always supported charity, he stepped things up a gear following the sudden death of his wife 12 years ago. Mr Webber added: "I do it because I believe in karma. You reap what you sow and whenever I've given something to someone else I've got it back tenfold.